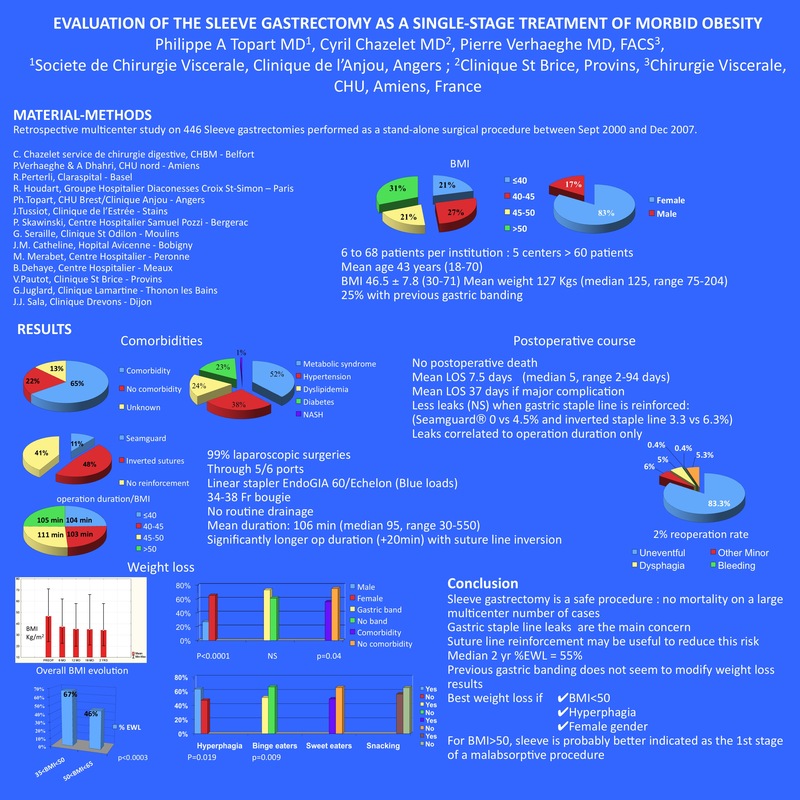 A multicenter, retrospective study reviewed the current practice of the sleeve gastrectomy in Europe to assess the early postoperative outcome as well as the effect on weight loss. 446 sleeve gastrectomies were performed by 14 centers between September 2000 and October 2007. Operative data, postoperative outcomes as well as 2 year weight loss were reviewed. The initial mean BMI of the patients was 46 (range 30-71) and their mean age 43 (18-70). 83% were women. 45% had at last 1 comorbid condition and 25% were gastric band failures. 99% of the procedures were performed laparoscopically with a 0.7% conversion rate. The sleeve was fashioned on a 34 to 50 Fr bougie. Methylene blue test was routine and 25% of the patients kept a naso-gastric tube for 48 hours. The staple line was oversewn or reinforced with buttressing material in 263 patients. The mean operative time was 105 mn (30-550) without difference according to the BMI. The overall rate of complications was 16.7% with 5.3% major (19/20 were gastric leaks) but none were fatal. Although the leak rate was reduced with staple line reinforcement (0 vs 4.5%) and oversewing (3.3 vs 6.3%), this was not significant and the only prognostic factor was the operation duration (p=0.03). The percentage of excess weight loss was stable after 1 year and 64% at 2 years. Male gender, comorbidities and BMI >50 significantly and adversely influenced weight loss. This large series demonstrates the safety of the sleeve gastrectomy. Although 2 year weight loss seems on par with gastric bypass, long term assessment is needed and limitating factors may exist.